This post clarifies the differences between the Baby Jogger City Mini 2011 (the current version) and the Baby Jogger Sidewalk which is produced by Baby Jogger exclusively for Kiddicare. There are also some notes about the new 2012 City Mini changes at the bottom. The Sidewalk is made in lesser fabrics. The seat fabric is plain black and the hoods are a single colour. There are some photos of both Baby Jogger pushchairs above. The Sidewalk chassis is black. The City Mini chassis is silver on the 3 wheel version. The 4 wheel version is black. The Sidewalk chassis is the old style chassis, without the lowered back bar to give better access to the basket from the rear. The Sidewalk has the original style smaller basket. The City Mini has a P.E. Board in the back of the seat which gives it rigidity. The Sidewalk does not have this. The City Mini has the ‘sit upright straps’ on the rear of the seat to allow the seat to be pushed forwards into a very upright position. The Sidewalk does not have these. The Sidewalk is not labelled as a City Mini. It does not have the embroidery of the City Mini and the side stickers are different. Both the Sidewalk and City Mini can take compact carrycots in both single or double mode. Both will take a car seat in single pushchair mode. The new 2012 City Mini models will feature fully lined hoods, a lowered rear bar and autolocks for carrying / storage. The Sidewalk does not have these features. The autolock on the new 2012 City Mini can be unscrewed, should you not wish to have this feature. 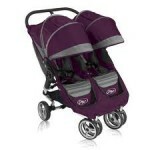 There is a new Compact Carrycot Plus coming in 2012 which will fit the single pushchairs, but not the double. I believe this will be hard bodied.